KANSAS CITY, Mo. — This year, the theme of the Catholic Education Foundation (CEF) Futures Art Event was eat, drink and give back. The sold-out evening at Boulevard Brewery in Kansas City, Missouri, on Feb. 28 met all those conditions and raised $37,000 for the Futures’ Guardian Angel Fund. Event chairs Cara Haas and Chris Miller greeted guests as they arrived in the brewery tap room and invited them to try some of the best beers in Kansas City. Patrons also were treated to an array of cocktails, the city’s famous barbecue provided by Fiorella’s Jack Stack and a dessert bar of cupcakes made by Aggie Gutierrez. 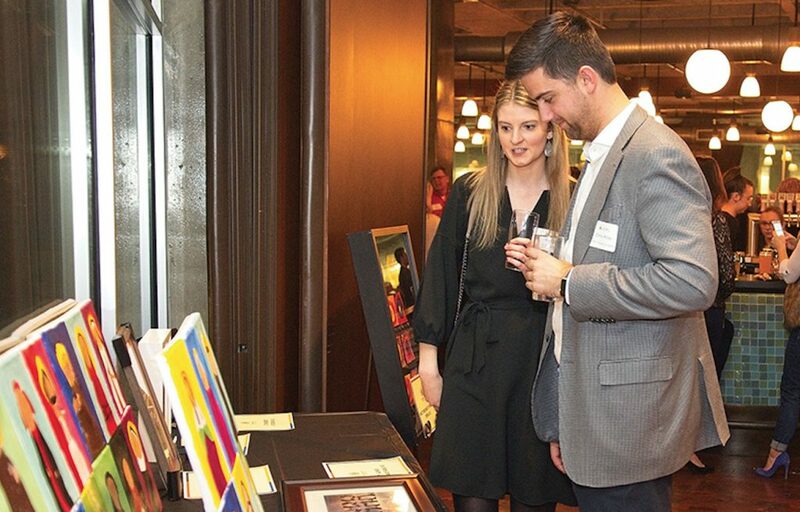 While enjoying the food and friendship, attendees were able to stroll around the room, viewing some truly outstanding artwork donated by local artists and art students at CEF schools. For the first time at this annual event, buyers interested in the artwork were able to use mobile bidding for silent auction items. CEF staff and young Futures members were on hand and more than happy to help non-tech-savvy attendees figure out the process. Student art was once again auctioned by raffle drawing. In addition to supporting local artists, Sexton assured guests they were making a positive difference in the lives of children. “Everything you give us tonight will go to the Guardian Angel Fund,” he said. Guardian Angel scholarships help families facing a short-term crisis — such as a job loss or unexpected medical bills — that impact their ability to keep up with tuition payments for their children. Archbishop Joseph F. Naumann was on hand to echo Sexton’s gratitude for the sold-out crowd and its support for Catholic education. The archbishop said the event brought up memories of his first days in kindergarten when his own mother was his teacher. He remembered struggling with the first art project assigned to the class by his mother. “I sat next to a young girl,” he said. “And she was an incredible artist. “I remember my mother told us we were supposed to draw something, and I kept trying to draw it, but it didn’t look anything like it was supposed to. Even though his own artistic talent is lacking, the archbishop was able to appreciate the art on display at the event and encouraged patrons to do the same. More importantly, the archbishop thanked those in attendance for their willingness to support the mission of the CEF. “Our schools help our students develop all their gifts and talents and every dimension of their lives,” he said. “And what makes our schools truly unique is that we’re developing their spiritual life as well. CEF associate executive director Erica Kratofil was pleased with the evening’s success and the young supporters who are looking to the future of CEF.